Widely known as ' Pink City', Jaipur is colour washed pink to welcome Prince Albert, the consort of Queen Victoria of England visited India in 1883 A.D. The city was founded in 1727 AD by one of the greatest ruler - Jai Singh II. 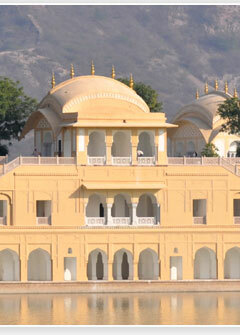 Jaipur is surrounded by hills on three sides, crowned by formidable forts and majestic palaces, mansions and gardens. Jaipur is the only city in the world, which is subdivided in to nine rectangular sectors symbolizing nine division of universe. Places of Interest : Hawa Mahal, City Palace, Jantar Mantar, Amber Fort, Birla Mandir, Jaigarh Fort, Nahargargh Fort, Sisodia Garden, Birla Planetarium. This golden city rising from the heart of 'Thar' desert was founded in 1155 Ad. The rulers of Jaisalmer were feared bandits chiefs who lived off the forced levies on the great caravans that crossed their area en route to Delhi. One of the last princely bastions, this settlement is known for the aesthetic sense represented by its palaces and havelis. Even today these palaces are inhabited. Jaisalmer is known for its colorful celebrations and festivals. Biggest draw of tourist from over the all over the world. Places of Interest: The Golden Fort with 99 bastions, Havelis, Gadisar Lake, Royal Cenotaphs at Bada Bagh, Lodurva Jain Temples, Sand Dunes at Sam & Khudi and Fossil Park-Aakal. The 55 Kms journey By Road from Agra drives to the town of Bharatpur, the eastern gateway to Rajasthan. Bharatpur is popular for its bird sanctuary- 'Keoladeo Ghana National Park' - one of the finest in Asia rich for its avian variety. Every year the rare Siberian cranes come to spend the winter in the warmer climate of Bharatpur. Places of Interest: Bharatpur Fort, Deeg Palace & Keoladeo Ghana National Park. 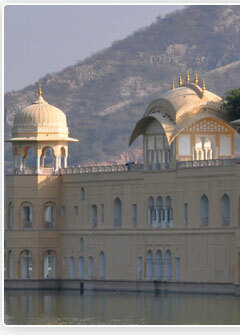 The only hill resort of Rajasthan, crowning at the highest peak of the Aravali hills at altitude of 1220 meters. 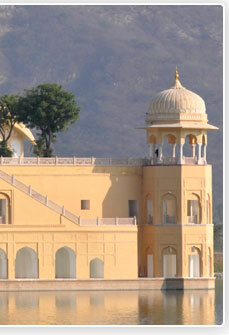 It is not the only one of the prettiest hill stations in the country, but also a major Rajput centre. Mt. Abu was dedicated to Lord Shiva before it became Jain pilgrimage center. The biggest draws for Mt. Abu are Dilwara Temples. The hill boasts of a rich vegetation and thick forest. It stands out like an oasis in arid environs. Places of Interest: Dilwara Temple, Adhar Devi Temple, Guru Shikhar, Sunset point, Nakki Lake, etc. 'Ajmer' owes its composite culture to the reign of many dynasties that came, ruled and left, behind indelible marks of their culture and traditions culture. 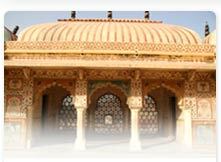 Ajmer is situated in a valley surrounded by the Aravali hills, 131 Kms West of Jaipur. It is also associated with remarkable historical events. 'Dargah Khwaja Sahib' the landmark of Ajmer. One of the holiest Muslim shrines in the country. The city has some splendid master pieces of Indo-Islamic architecture. 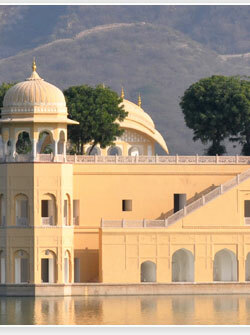 Places Of Interest: Taragarh Fort, Khwaja Moinuddin - Chisti Dargah, Brahma Temple, Man Mahal, Bathing Ghats and the Lake. The home of Rathores - The awesome princely city of Rajasthan founded in 1459 A.D. by Rao Jodhaji today one of largest city of Rajasthan. Once the capital city of Marwar state. Crowning at it is the imposing Mehrangarh fort. The old city is situated at foothill of a hillock. The city built in a high wall 10 kms. long with 8 gates and innumerable bastions. Umaid Bhavan Palace could be defined as Taj Mahal of North India. The city carries rich heritage and culture and flourishing industry of wood, cattle, camels, salt and agricultural crops. Places of Interest - Meharangarh Fort, Jaswant Thada, Girdikot, Mandore Garden, Umaid Bhavan, Mahamandir Temple and Bishnoi Tribal Village where deer's are held sacred.